“Yesterday was just as hectic as Monday, but after taking some time to explore the International Polar Year 2012 Conference (http://www.ipy2012montreal.ca/) on my own I met two wonderful ladies who both had passion that just radiated. Their names were Wendy Trusler and Carol Devine. Both women had a truly deep love for the Antarctic and were trying to rally people together using food. They are currently publishing a cookbook named The Antarctic Book of Cooking and Cleaning, which is set to be released in the fall. I had seen them earlier in the day on stage trying to entice people which their cinnamon buns, and it was clearly working because I heard many times that they were wonderful. Later on in the afternoon they came by our booth and after agreeing to share their blog if they checked out our delegation page they moved on quickly trying to take everything in. I felt like there was more to say and so I asked them if they had a minute to talk. We ended up chatting for a while and we realized that we actually had a common link. Geoff Green, of course they knew Geoff. It turns out that he had been on a ship that they had traveled on over 15 years ago. It was a truly great feeling to know that these two women had been following their dreams and truly living wonderful lives. They urged me to jump before I was ready, and to never give up on myself. I hope to stay in contact with them and it just goes to show that if you do take a leap of faith you will meet truly incredible people. Small world in a big world. We too think it was a pleasure to meet Brigitte Graham who traveled with Students in Ice (SOI) to Greenland, Iceland, Nunavik and Labrador and is a part of the SOI delegation to Rio in June 2012 for the Rio+20 Earth Summit. Brigitte’s dedication to polar education and protection as well as her chutzpah is fantastic. She and other youth leaders, SOI alumnus and polar ambassadors are studying, active and impressive (the delegates bios illustrates what feats you can do under age 19) and will undoubtedly continue to explore, contribute and advocate for the health of the earth. I know Geoff from his days leading Antarctic and Arctic expeditions with Marine Expeditions who provided discounted ship passage for VIEW volunteers. 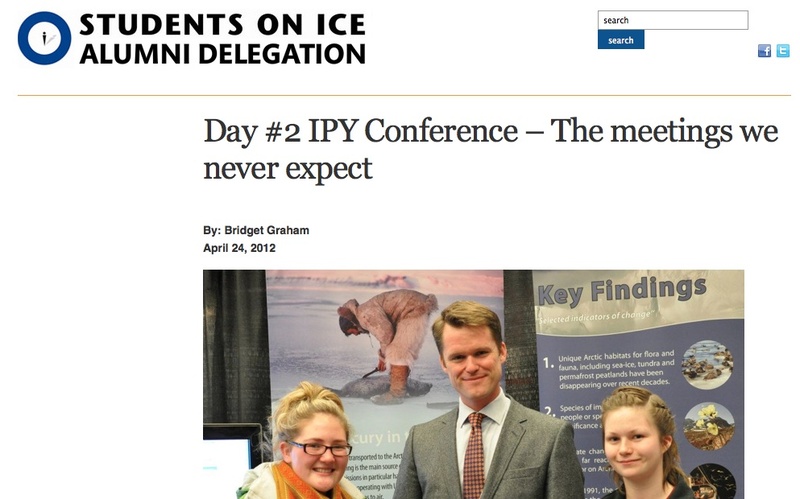 It’s great to see what Geoff is doing with Students on Ice and the Alumni’s objectives and activities. Specific attention paid to and recognition of the environmental importance of the Arctic and Antarctic, of their disproportionate vulnerability to degradation through environmental change, and of the necessity for collaborative action from states for their preservation. A tangible and achievable vision of the sustainable future that will inspire and encourage people of the polar regions to become engaged in the movement towards sustainable development, and the preservation of their environment. A specific and politically-binding outcome document ensuring countries’ commitment and accountability to sustainable development globally – including the polar regions – with clear recommendations and mechanisms to track and continually assess the progress of the outcomes. Youth-adult partnerships where youth have equal opportunities to actively provide input during the Rio+20 Process and Conference. Active partnerships can include: youth attendance in meetings, youth-led side presentations for decision-makers, formal conversations between youth and decision-makers, and other participatory approaches. At the International Polar Conference going on here in Montreal there is an outdoor photo display about explorer Roald Amundsen by the Norwegian government paying tribute to him but especially to the Inuit in Canada’s Arctic and the knowledge they shared with him. One survival method Amundsen learned and documented was to feed your weakest dogs to the healthiest dogs when times were seriously tough.